A big part of an author's job is to promote their book to boost sales. 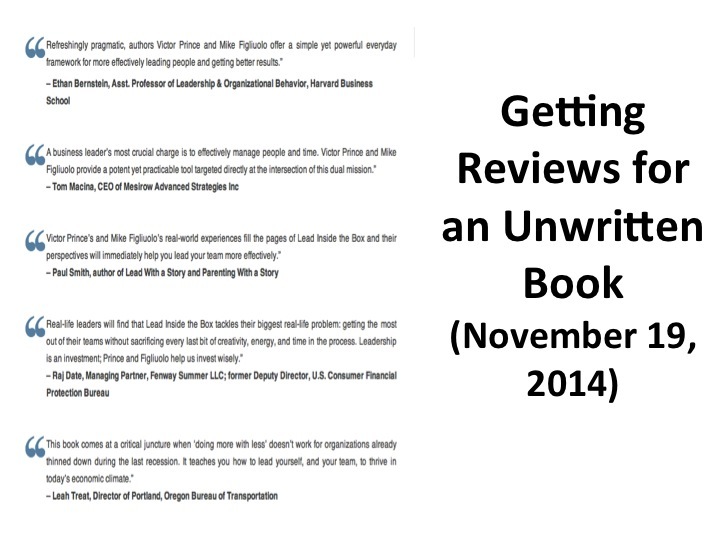 One way to do that is to get testimonials, or reviews of the book, by people with impressive names or titles that will make other people intrigued enough to buy it. So that is what I am doing now. I am going through my network of LinkedIn and Facebook connections and getting a list of people who would be good names and titles to have on the book cover, the website, etc.. It is actually a fun excuse to go through my networks to see what people are up to. That said, I hate asking friends for favors, so I need to get a bit better with that. Mike is gathering testimonials as well and he is much better at it than me. In fact, for his first book, he took a shot in the dark and asked Duke's legendary basketball coach, Mike Krzyzewski for a review. It wasn't totally a shot in the dark, as Mike was a fellow West Point grad and Duke professor, but I was still impressed that Coach K responded quite quickly with a well-thought out review of his outline. I better get on it.